A Canadian tech company, whose founder claims it’s the most transparent way to sell and buy real estate, is attempting to change how home sales are conducted. Toronto-based nobul lets homeowners list their properties and have realtors bid on their business by offering extra services or a reduced commission. Home buyers and sellers can then rate the agent they used on nobul’s app – much like you would rate an Uber driver. Regan McGee, the founder and the company’s chief operating officer, says the company was created two years ago with a desire to upend how home purchasing and selling is conducted. He claims the fee structure for real estate agents hasn’t changed in 100 years, despite modern home buyers doing a lot of the research for a new property on their own. In Vancouver, the average commission can be five or six per cent on the first $100,000, and about two to three per cent on the remainder. “The job of being a real estate agent has completely changed, except the fee structure hasn’t,” said Regan McGee, the founder and COO of nobul. The company takes a small fee from agents if they close a transaction, but nothing from buyers and sellers. The app and website have reportedly been used in Florida, Texas and in cities across Canada. Nobul claims its site and app have been used in Vancouver but couldn’t say if a contract has been completed in the city. Despite claims of upending the real estate market, local realtors say they’re unconcerned by the new competition. “Not at all,” said realtor Vince D’Ovidio when asked if he feels threatened by nobul looking to interrupt his business model. D’Ovidio said brokers have long offered lower commission to sell homes, but consumers largely rely on word of mouth when it comes to choosing a realtor. “You do your best and if you’re good, you’re going to last and that’s just the way it works,” he said. 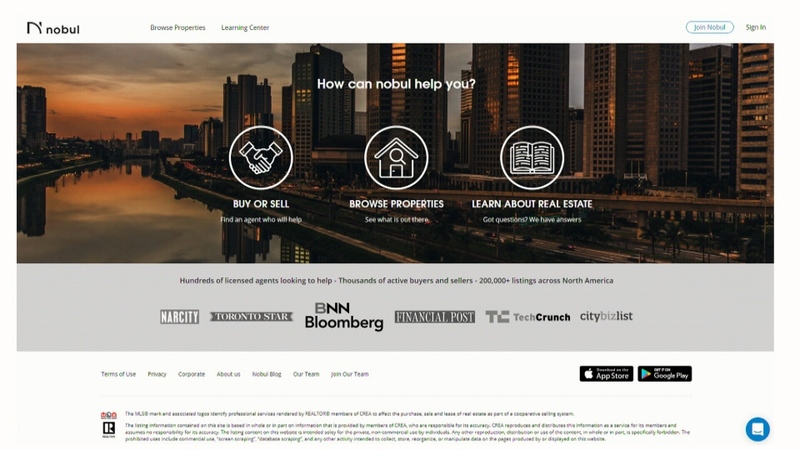 Toronto-based tech company nobul says it's looking to upend how the real estate market functions.